Employee Portal can be configured for a variety of scenarios. This reference provides details of each setting and where it would be applicable. 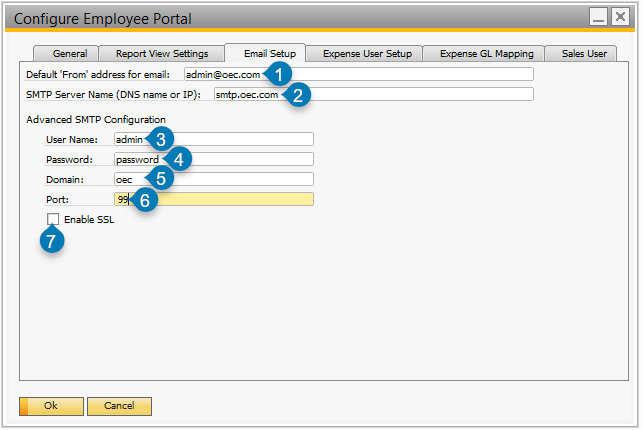 Employee Portal configuration settings are accessible in SAP Business One using InterConnect Manager Add-On. Start the add-on and navigate to: InterConnect Manager AddOn > Administration > Employee Portal Config. Configure Employee Portal window General tab, as described below. Allow Users to reset their Passwords (1) If enabled, this setting will display a link on the main login page. This link will allow Employee Portal users to send a password reset email to their email address, provided the user is enabled for web login. Query Portal Web Address (2) When this field is set to the Employee Portal website address, it allows the configuration screen to recycle the Employee Portal application pools when changes are made to the settings. Report View Settings can be configured as described below. This screen determines how much control users have to configure their own custom views of existing reports. 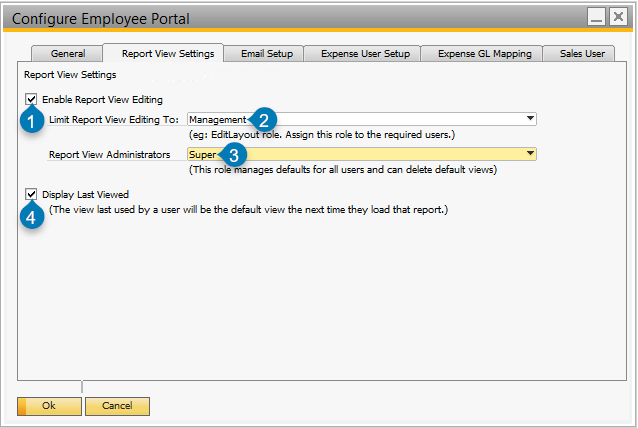 Enable Report View Editing (1) Allows users with the specified role to edit their own saved report views. The role this applies to is configured in the Limit Report View Editing To drop-down (2). Administrators may set global views; this optional setting is assigned to the role set in Report View Administrators (4). Display Last Viewed (3) Allows users to automatically see their last manually configured and saved report view instead of the default report view. Email Setup settings can be configured as described below. Default “From” address for email (1) This email address will be used on all outgoing emails as the “From” address. SMTP Server Name (DNS name or IP) (2) This field can be used to specify an SMTP Server to connect to for all outgoing emails. Advanced SMTP Configuration (3, 4, 5, 6, 7) Set these credentials to connect to the SMTP Server (defined above the advanced settings). Ensure that Enable SSL is only enabled if required. Note that Expense User notification features require the Email Setup Tab above to be configured. Employee Portal Expense User basic settings, as described below. Notify on missing Approver email address (1, 2) If configured, when a manager record doesn’t have an email address, then the specified email address will receive a message. This serves as a notice to the administrator to configure the expense manager’s user with a valid email and Expense User license. For example, if Bob submits a request and his manager Sue doesn’t have an email address on her Employee Master Data record, then an email will be sent to user-admin@oec.com. This will notify user-admin that Sue doesn’t have an email address and can’t properly be notified. Enable Expense Request (3) When enabled, this supports Expense Request functionality. This allows users with the Expense User role to submit Expense Requests, and allows administrators to see Expense Request reports. Require Manager Approval above $ (4, 5) When enabled, if an Expense Request is submitted and totals more than this amount, then a manager must approve the Expense Request before it can be copied to an Expense Claim. For example, if Bob submits an Expense Request for $300, then his manager, Sue, must approve the Expense Request before Bob can copy the details to an Expense Claim. This is because Bob’s request of $300 is above the amount set for Manager’s approval, which is $0. Require Manager’s Manager Approval above $ (6, 7) When enabled, if an Expense Request is submitted and totals more than this amount, then after the first manager approves the Expense Request, a second manager (the first manager’s manager) must also approve the Expense Request before a PO is created. For example, if Bob submits an Expense Request for $6500, then his manager, Sue, must approve the Expense Request. Sue’s manager, Terry must then approve Sue’s approval before Bob can copy the details to a Claim. This is because Bob’s request of $6500 is above the amount set for Manager’s Manager approval, which is $5000. 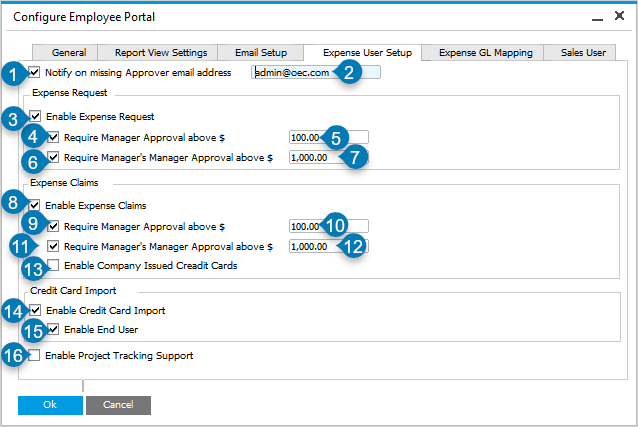 Enable Expense Claims (8) When enabled, this allows Expense Users with the Expense User role to submit Expense Claims. Require Manager Approval above $ (9, 10) When enabled, if an Expense Claim is submitted and totals more than this amount, then a manager must approve the Expense Claim before a PO is created. For example, if Bob submits an Expense Request for $300, then his manager, Sue, must approve the Expense Request before a PO will be created. This is because Bob’s request of $300 is above the amount set for Manager’s approval, which is $0. Require Manager’s Manager Approval above $ (11, 12) When enabled, if an Expense Claim is submitted and totals more than this amount, then after the first manager approves the Expense Claim, a second manager (the first manager’s manager) must also approve the Expense Claim before a PO is created. For example, if Bob submits an Expense Claim for $6500, then his manager, Sue, must approve the Expense Claim. Sue’s manager, Terry must then approve Sue’s approval before a PO will be created. This is because Bob’s request of $6500 is above the amount set for Manager’s Manager approval, which is $5000. Enable Company Issued Credit Cards (13) When enabled, this allows employees to flag Expense Claim lines as paid with a “Company Issued Credit Card” instead of a personal payment. When the claim line is flagged with this option, it indicates that a PO will be created against the Credit Card vendor instead of the Employee’s assigned vendor. See Configuring Expense Users for more details. Enable Credit Card Import (14) When enabled, it allows Expense User administrators with the appropriate role to use the Credit Card Import feature to import credit card lines in bulk using configured import templates. See Credit Card Import Setup for more details. Enable End User (15) When enabled, this option allows end users with the appropriate role to access the Credit Card Import functionality. See Credit Card Import Setup for more details. Enable Project Tracking Support (16) When enabled, it allows Expense Users to select an active Project when submitting Expense Requests or Expense Claims. Definitions of the various options are shown below. For a walkthrough of setting up the GL Mapping, see GL Mapping Configuration. Employee Portal Expense User GL Account settings, as described below. GL Segments (1) If enabled, allows for GL Segment Rules to be configured. GL Segment rules define how segments are applied to Expense Request and Expense Claim detail lines. These rules can be configured based on user configuration, expense type, or global settings. See Defining GL Account Mapping Rules for more details. Cost Center Dimensions (2) If enabled, allows for Cost Center Dimensions to be configured. Cost Center Dimension rules define how these dimensions are applied to Expense Request and Expense Claim detail lines. These rules can be configured based on user configuration, expense type, or global settings. See Defining GL Account Mapping Rules for more details. Validate Configuration (3) Press this button to manually validate configuration settings against configured users and expense types. If users or expense types are not configured properly, a prompt will be displayed to allow an admin user to configure the missing details. - Type (4) - Either Seg for Segment or Dim for Dimension. Includes a golden arrow drill-down to allow details to be edited. - Seg/Dim (5) - A descriptive name for the segment or dimension. - Source (6) - Where the rule originates. For example, user configuration versus a global setting. - Rule (7) - The rule definition. - Default Value/Value (8) - If applicable, the default value or assigned value, depending on the Source. Sales User settings are described below. Employee Portal Sales User settings, as described below. Map Quest API Key (1) This can be used to enable maps in Sales User. Map Quest offers a free plan that is sufficient for normal Sales User usage. If this plan doesn’t meet your needs, other options are available from Map Quest. Sign up for an account at Map Quest: developer.mapquest.com/plans, then go to Keys & Reporting > My Application. 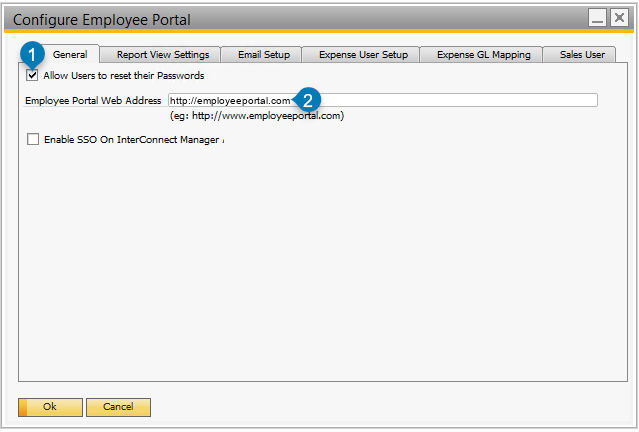 Use the Consumer Key for Employee Portal config. Card Code Generation Method (2) This option allows you to manually enter new card codes (as selected) or to use a query to generate new card codes (middle option), or to use a configured B1 Document Number Series (right-most option). Send email when task assigned to Portal User (3) When assigning a task to a Portal user, an email will be sent to the user, notifying them of the new task. 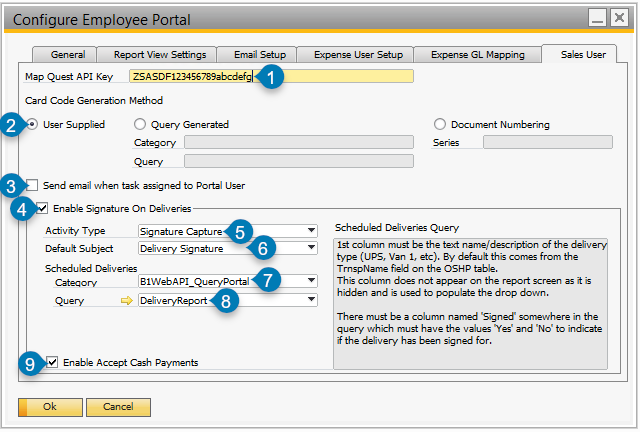 Enable Signature On Deliveries (4) When enabled, Named Sales Users with the appropriate Employee Portal roles may useany web-connected browser (such as on a phone, desktop or mobile device) to capture customer signatures. Configuration options are described below. Activity Type (5) and Default Subject (6) These values define which Activity Type and Default Subject will appear on the signature associated with a delivery. See Activity Setup for details about configuring Activity Type and Activity Default Subject for signatures. Category (7) and Query (8) This category and query defines the delivery report used by Delivery people. Out-of-the-box, this report is found under B1WebAPI_QueryPortal/DeliveryReport. A custom query may be used, and must belong to a category starting with B1WebAPI_. Enable Accept Cash Payments (9) When enabled, the delivery person may flag a delivery as paid, allowing the customer to sign for the delivery and payment. Employee Portal Order Pad configuration settings are accessible in SAP Business One using InterConnect Manager Add-On. Start the add-on and navigate to: InterConnect Manager AddOn > Administration > Employee Portal Order Pad. 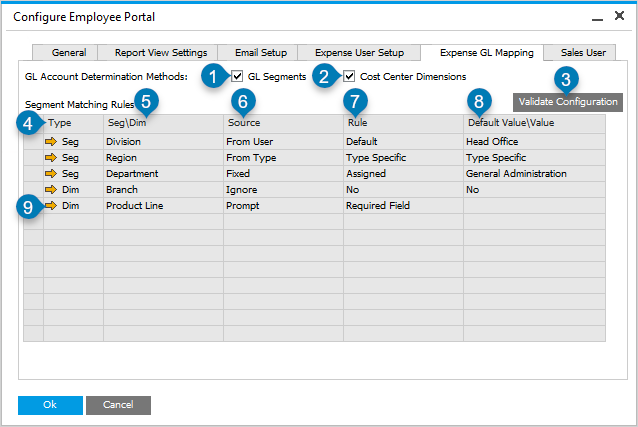 This screen outlines details related to advanced Order Pad settings for Employee Portal. Employee Portal Order Pad settings as described below. 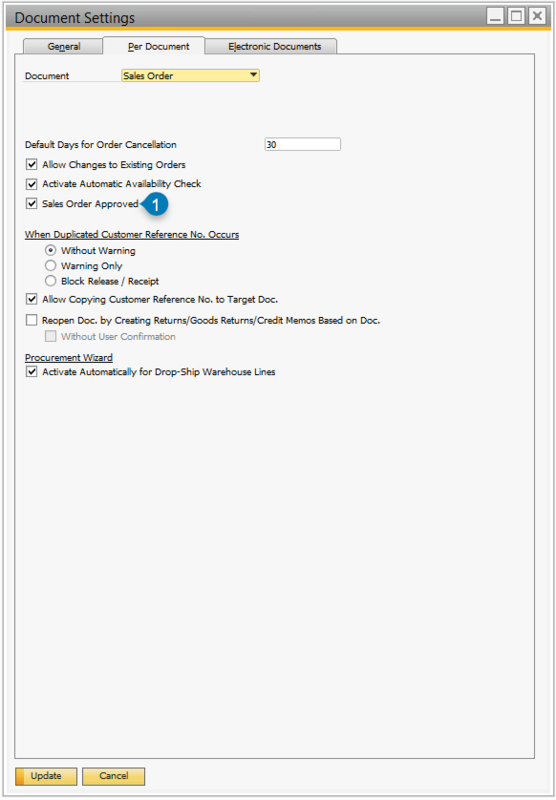 Order Type (1) Sets the Order Pad order type to either Unapproved Order or Sales Order. Note that this setting is restricted based on the B1 Per Document setting for sales orders, found in Administration > System Initialization > Document Settings > Per Document tab > Sales Order document. If this setting is un-checked, the Portal setting above will not apply. Enable Custom Addresses (2) When enabled, a Sales User may enter a drop-ship address when placing the order. This drop-ship address does not get saved to the customer’s account. Requires that an option is selected for Default tax code for custom addresses. Enable Custom Addresses Tax Selection (3) When enabled, Tax Code is chosen based on a query in B1. Configure B1WebAPI_SU/TaxCodeLookup with a custom query to handle advanced Tax Code lookup. Default tax code for custom addresses (4) Only applicable if Enable Custom Addresses is enabled. Allow Creating Orders (5) When enabled, this allows Employee users with a Named Sales User license and role to access Order Pad functionality. Enable Discounting (6) When enabled, allows Employee users to apply discounts to orders. Maximum line level discount % (7) restricts line discounts so they must be lower than this value. Maximum order level discount % (8) restricts order discounts to this percentage or lower. Allow Creating Quotes (9) When enabled, this allows Employee users with a Named Sales User license and role to access Quote Pad functionality. - Orders must not have any lines shipped or invoiced. - Orders must be selected as editable by the query B1WebAPI_SU/IsOrderEditable. - Quotes must not have any lines added to an order. - Quotes must be selected as editable by the query B1WebAPI_SU/IsQuoteEditable. Notify users of new orders\quotes (15) When enabled, Employee Portal will send an email to the sales user who placed the order. Notify inside sales of new orders/quotes (16) When enabled, when a sales person submits an order, Employee Portal will send an email to the email address set in the field Inside Sales email address. Notify admin user of order pad failure (17) When enabled, if a web error occurs during order/quote placement, Employee Portal will send an email to the email address set in the field Admin email address. 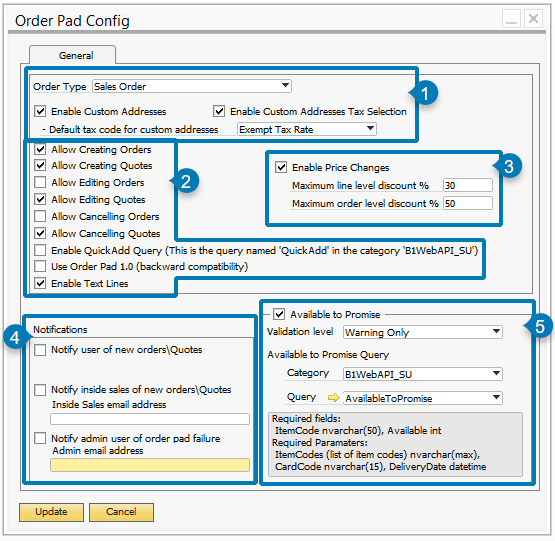 Available to Promise (18) When enabled, Order Pad and Quote Pad will display Available to Promise quantities based on the configured query. By default, this query is B1WebAPI_SU/AvailableToPromise. - Warning Only specifies that the order may be placed when quantities are out of stock. - Block Backorders ensures that only items that are in stock (as specified by the configured query) can be ordered.